Lots of people look embarrassed (why?) then ask the national origin of the name "Plesums" (Latvian). Don't be embarrassed! We have found two apparently unrelated families in the United States, a family in Australia, plus a few others who routinely use the name Plesums, but so few that we are really surprised when we see the name. In this list we are only counting people who use the name "Plesums" on a day-to-day basis, not all the related people. I haven't met any of the following people outside of the Michael Plesums family, but have seen their name, sometimes repeatedly, on the web. If your name is here and you want to be removed, or want to correct your listing, please send an e-mail to charlie@plesums.com and I will gladly make the change. If your name is Plesums, and you are not listed here, please send me a note (in English), with a brief description, and, if you would like, a link to your web page or e-mail. It would be fun to expand the list. The word Plesums, in Latvian, reportedly means a separation such as "a piece of plowed ground" or a tear (as in a tear in the earth), or a seam in fabric that is coming apart. Therefore the student newspaper/magazine at the Latvian Agricultural University is named "Plesums", with the logo above. Michael Plesums was born in Riga, Latvia in 1905. Click here for early pictures from his life. He was an officer in the Latvian navy, but in 1935 took a leave of absence from the navy to sail a small boat across the Atlantic to the island of Tobago. A newspaper bought the boat, in exchange for articles about the trip. One adventure led to another until he finally settled in the United States and married Gertrude Emma Rodgers, on February 21, 1942. He lived in the United States for the rest of his life. There are 13 people in the United States descended from Michael Plesums by birth, adoption, or marriage, who use the name Plesums regularly. Charlie Plesums (1943- ) is one of Michael's sons. Jenny Plesums and Charlie Plesums of Austin Texas are the host of this web site. 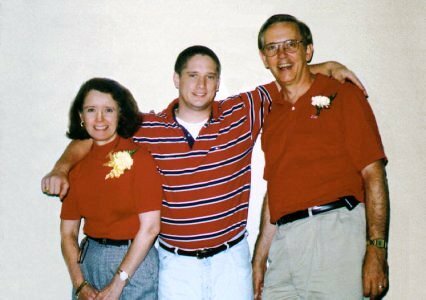 Jenny and Charlie's son Mark Plesums (1975- ) of Sachse, Texas, is a database administrator working in the Dallas area. His wife Stacey and daughter Chelsea have changed their names from "Day" and are gradually moving to use the name Plesums. There are 5 people using the name Plesums in Charlie's branch of the Michael Plesums family. George Plesums (born Juris Valdemars Plesums 1931-2010) is another son of Michael, by his first marriage. Tim Plesums (1965- ) is George's older son. He lives in Warsaw with his wife, Caren McIntosh Plesums (a teacher), and their kids Quinn and Logan. Tim works with engineering graphics. Tracy Plesums (1966- ), George's other son, is a teacher and coach. He and his wife Shelly Draper Plesums also live in Warsaw, with their kids Carissa and Jacob. There are 8 people using the name Plesums in George's branch of the Michael Plesums family. Rita Plesums Isenberg (1946- ) is Michael's youngest daughter, a retired Librarian, and string bass musician, in Montgomery County (near Bethesda) Maryland. Although (as an Isenberg) she has graduated from this list, her late husband and two kids add three relatives. It is interesting to find that there is another Rita Plesums - see below. Valdemars Plesums, born in Riga Latvia in 1905, is the son of Augusts Otto Plesums, born 1884. Their family tree was traced back to 1742, to the seven sons of Martins and Katrine Plesons. Note the different spelling, Plesons, a Latvian word meaning "ruffian", rather than Plesums, which in Latvian means a split or separation, often a piece of plowed ground or a seam of clothing coming apart. Note that Valdemars Plesums and Michael Plesums were born in the same city in the same year, but appear unrelated. The middle names of Michael's first two children are Valdemars and Velta, which suggests that they may have at least known each other. Valdemars Plesums (1905-1984) and Velta Braslis Plesums ( -1995) had four children, Guntis, Juris, Mara, and Janis. There are 8 people in the United States, descended from Valdemars Plesums, who use the Plesums name regularly. Guntis Plesums is a professor emeritus of Architecture at the University of Oregon. Count two people still using the name Plesums in this family. Juris Plesums Sr., a Latvian diplomat and farmer and his wife Rita Plesums, a school Psychologist, live in Spooner, Wisconsin. Their children are Judite, Juris Jr. and Karlis. With spouses, there are 5 people using the name Plesums in the Juris branch of the Valdemar Plesums family. Judite Plesums Fluger is an attorney in White Bear Lake Minnesota. As the wife of engineer Steve Fluger she has graduated from the list of people using the name "Plesums" on a day-to-day basis. Juris Plesums Jr. is an artist and glass blower in Minneapolis. Mara Plesums Farnsworth is an artist in Santa Rosa, but as a "Farnsworth" has graduated from this list! Sandra Plesums is the wife of the late Janis Plesums, a space scientist with Lockheed Martin. She is listed as a member of www.ReadingRecovery.org from San Jose, California. Add one person using the name Plesums to the Valdemar Plesums family list. Anna Plesums (1924- ) has published at least two poetry books through Unfinished Monument Press, and published a poem on the Simcoe County (Ontario) web site. Arijs Arthurs Plesums was born in Riga, Latvia March 9, 1931, and arrived in Melbourne Austrialia with his parents Alberts and Pauline on April 27, 1948, after a voyage of almost two months aboard the "SS General Black." Arjis has an older brother Gunis, who lives in Australia, and has two married daughters. Arijs father Alberts had a brother (now deceased) Peter Plesums who was a high ranking politician in Riga. Peter has a son also named Peter Plesums, living in Latvia, and an adopted son Janis Plesums, a well known actor, also living in Latvia. He also had two sisters named Anna & Alma both deceased. There does not seem to be a family relation between this branch and the other Plesums listed. Paul Aaron Plesums (July 15, 1967 - ) and wife Danielle (January 26, 1968-) have three children, Angus, and twins Claudia, and Olivia, and reside in the coastal family home in Tamarama Sydney, NSW. Paul and his wife both work in the family magazine publishing business. Claudia is on Facebook, and rightly complains that this picture is several years old. Count 5 people using the name Plesums in Paul's branch of the Arijs Plesums family. Jason Alexander Plesums (May 29, 1970- ) also works in the family magazine publishing business, and lives in the Lilyfield section of Sydney. He had two children in his first marriage, Tom Plesums (1992- ) and Sophie (1994- ), and Ashton with Joanna (and one more on the way). Count 5 people using the name Plesums in Jason's branch of the Arijs Plesums family. Ariana Renata Plesums (December 13, 1978- ) also works in the family publishing business, as does her friend Brett, but she hasn't (yet) graduated from the list of people who use the name Plesums on a daily basis. She also lives in the Sydney area, and keeps horses and other "pets." Count one person using the Plesums name in Ariana's branch of the Arijs Plesums family. Overall there are 14 people in Australia using the Plesums name. Mr. Rets Plesums, aide to the president of Latvia and Latvian Foreign Ministry spokesman, appears frequently in searches of the internet. In May 2009 I finally met him on Facebook, but he returned to Latvia from his diplomatic assignment as ambassador to Kazakhstan shortly after our visit to Latvia. There is reportedly a Peter Plesums Jr., and an adopted son Janis Plesums, a well known Latvian actor, that are remotely related to the Australian Plesums family. I cannot find reference to them on the web. There are a couple more on Facebook that I have not met. Searching the web found a "populated area" in Latvia named "Plesums" but I cannot find it on any map. It may just be a plowed field (see the definition of the word "Plesums"). ©2000, 2007 by Charles A. Plesums, Austin, Texas USA. ALL RIGHTS RESERVED.